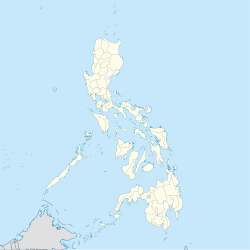 Dagami, officially the Municipality of Dagami, is a 3rd class municipality in the province of Leyte, Philippines. According to the 2015 census, it has a population of 35,147 people. Waray-Waray is the language spoken by the residents called Dagamin-on. It is classified as a third class municipality and mere dependent on agriculture such as coconut, rice and corn farming. The employment rate is 63% of the total population workforce in the municipality. Its total land area of 161.5 square kilometers, equivalent to 16,165 hectares. More than half of its plains on the eastern side is cultivated for rice and corn farming while the western side is planted with coconut with the westernmost area as forestland. Coconut is a major source of income form Paml wine and copra - the raw material for production of coconut oil. The town of Dagami is famous for its local delicacies called "Binagol" (made with sweetened mashed giant taro called talian and packed in half of a leaf-covered coconut shell), "Moron" (sweetened sticky rice stick with peanuts and chocolate) and "Sagmani". The most powerful sultanate in the island was Dagaran, the sultanate ruled by Diwaranda Mohammed. He had daughter named Sayajamburan who was sought by men everywhere. The nearby kingdoms were Bumbaran and Kahagna, sultanates of King Mapandara and King Mabanig, respectively. King Mapandara had a son named Bantugan who was the commander of his father’s army and was sought after by many women because of his strength and good looks. Sayajamaburan was secretly enamored by Bantugan’s physical and intellectual prowess. Bantugan has asked of her hand but was refused although he knew he had hopes of winning her in the end. The ruler of Kahagna, King Mabanig, was also a close rival of Bantugan. He was wealthy and got along well with everyone. When Sayajamaburan’s father was dying, he chose Bantugan as his daughter’s husband. Two days before the scheduled wedding, there was rejoicing everywhere except for King Mabanig who declared war against Bantugan’s kingdom. Bantugan came out victorious and the wedding took place. Bumbaran, Dagaran and Kahagna then became one by affinity and conquest. The fusion of the three kingdoms made Dagara more powerful and respected. In 1478, two hundred years after the three sultanates unite into one kingdom, changes took place. Its capital, Dagilan, increased in population. The culture and social life of the kingdom further evolved with the entry of the Chinese and the Hindus. The people engaged in trade both with Asia and Europe. When the Spanish conquistadors arrived in Leyte in 1521, trade mostly took place in the villages bordering the sea, where Dagilan was located. As early as 1613, the Jesuits mission established its rectory in what is now the Saint Joseph complex beside the municipal hall complex. This made the town a cabicera or what is today capital of the province. When the Jesuits were expelled in the Philippines, the Augustinian mission which succeeded them transferred to Palo and declared it as a town in 1768. In 1783, Burauen was carved out from the barrios of Dagami to become a separate town. Burauen used to be a missionary church under the diocese of Dagami. In 1883, the town of Pastrana was carved out from the barrios of Dagami. Years later, it reverted as part of Dagami in 1893 until it was finally settled as a separate municipality in 1912. In 1953, barangay Tabontabon together with other barangays of Dagami and Tanauan, were incorporated to constitute a new town of Tabontabon. In 1957, the barrios of Capahu-an and Guingawan were transferred to the newly-founded town of Tabontabon, which used to be a barangay of Dagami. Dagami is bounded in the north by Binahaan River across the municipality of Pastrana, on the north-west by Albuera and Ormoc City over the mountain range, on the south-west by Burauen, and on the south by the town of Tabon-tabon, southeast by the town of Tanauan and on the north-east by Palo. The town is located 32 kilometres (20 mi) from the provincial capital, Tacloban City. Dagami is politically subdivided into 65 barangays and two non-legislative districts. For purposes of education administration, the municipality is divided into Dagami North District and Dagami South District. In the 2015 census, the population of Dagami, Leyte, was 35,147 people, with a density of 220 inhabitants per square kilometre or 570 inhabitants per square mile. The people of Dagami speak Waray, a native language of Leyte and Samar. Waray is closely related to other Visayan languages particularly Hiligaynon and to a lesser extent Cebuano which is spoken by people of greater geographic proximity mainly in western municipalities of Leyte and of entire Southern Leyte. Rice and coconut production is the primary economic source of income for the townsfolk. Aside from farming, food processing is another source of income for the town of Dagami. Recently, an upsurge in labor export (OFWs) have contributed to remittances of income from abroad. Commercial businesses are limited to retailing while trading activities are limited to rice and copra trading. Despite popularity of its indigenous food product - the Binagol, Dagami has yet to maximize its economic potentials, such as creation of labor during its production line, income to be generated from sales, and revenue for the local government in terms of income taxes. Copra - Production of copra - a by-product of coconut tree fruit is the main industry of the townfolks. The growth of local economy is highly dependent on copra production due to price fluctuation in the market of its by-products such as oil, dissicated coconuts, and other raw materials made from leaves, bark, and the coconut fruit itself. Rice - Rice farming is the second source of livelihood for the people of Dagami. Almost half of the land area is planted with different variety of rice stocks. It is likewise the second most traded product in the town next to copra. Binagol - The town of Dagami is known for its local delicacy, the "Binagol" - a sweet, glutinous mixture of cassava, legume crop and other ingredients cooked with filling made of sugar, coconut and milk placed in a coconut shell or "bagul" and wrapped with banana leaves. Dagami also has other local delicacies such as "Sagmani", and "Moron". The "binagol" is sold in the city market primarily in Tacloban City while some reach the international markets. Tuba - Tuba is a well-known drink to Leyteños. Aside from copra production, the gathering of this product from coconut sap is another source of livelihood for Dagami-ons. "Tuba" is then traded in the market by local entrepreneurs but often sold directly by the gatherers. Dagami's total Internal Revenue Allotment (IRA) for fiscal year 2009 is P49,212,979, placing the town at no. 17 among the 41 towns of Leyte. From year 2003 to 2009 alone, Dagami has generated P249,089,980 for the municipal government. This is on top of local revenue sources which are the business and real property taxes including levies, fees and other charges. Mount Amandewing, the highest point in Leyte Province. The town of Dagami is traversed by many rivers and streams upland. The biggest river is Panda River which cuts across the town's north-east section. Sawahon River is among its tributaries which is also joined up stream by its major tributaries such as Hilabago River, Kababatuan Dako (Greater Stones) River and Kababatuan Guti (Smaller Stones) River. During the rainy season, when these rivers rise, the downtown or Poblacion is flooded causing damages to property. A river dike which is also a diversion road was built to protect the town center. But as the river rises higher than the dike, it overflows causing more water to flood the town center. The majestic Mount Amandiwing located near Dagami is the highest peak in Leyte. The imposing mountain is a protected natural park where wildlife such as pigs, deers and monkeys are hunted by local hunters despite by a local ban. During the 1960s, a logging concession was permitted to cut its virgin forests but the concessionaire never replanted trees. Locals exploited the situation by farming the logged area and creating coconut plantations. The mountain is best viewed from the town proper. On approach to the town proper, the mountain is an imposing majestic hill where smokes billow from different parts like chimneys. Up in the mountain near its peak, one could see the vast Pacific Ocean. The Millennium Arc - the main entrance to the town square, where the Dagami Municipal Hall is located. The incumbent Municipal Mayor of Dagami is Esmeralda Ortega, popularly known to Dagamin-ons as "Nene". Ortega was first elected as Dagami's first woman mayor in May 2004, defeating Gavino Berino III. She was re-elected to a second term in 2007 and a third consecutive term in 2010. Due to term limits, she is no longer be eligible to run for a fourth term in the upcoming 2013 local elections. b At this time, after the People Power Revolution, President Corazon Aquino forced the resignation of all local government unit heads and appointed officers in charge in their place. The Dagami Municipal Seal represents the town's humble achievements. The center of the seal shows the town's Municipal Hall (above), the seat of Dagami's local government. Its upper left side features the St. Joseph Parish of Dagami and the other side shows a faucet that represents Dagami as the source of fresh water of the Leyte Metropolitan Water District (LMWD), the local distributor of fresh water in the 1st District of Leyte, namely where the capital of the Province is, Tacloban City. The lower part of the Seal on the left side symbolizes the Municipality's dependency on agriculture, and the other side features the local delicaicies of the town, especially the "Binagol" or sometimes known as "Lidguid". The major colors of the seal are green and yellow, the colours of the St. Joseph Parish, where the statue of the town's Patron Saint, St. Joseph is enshrined and beautifully presented in a wooden and hand-decorated altar. Local townfolks recognize the importance of education, hence local leaders are working very hard to provide the people access to education as most prominent higher educational institutions in Leyte are in the provincial capital, Tacloban City, Tabontabon, and Tanauan. When the town became the capital of the Jesuits, the friars established a school which still stands today. Almost all barangays in the town have primary and intermediate schools. The five major elementary schools are Dagami North Central School, Dagami South Central School, both situated just a few meters apart in the town proper, Patoc Elementary School in the north, Guinarona Elementary School in the West and Balilit Elementary School in the south. The town has five secondary schools; one stand alone senior high school, one stand alone high school, two integrated public high schools, one integrated elementary and high school, and one private high school run by the local parish. The lone stand alone public senior high school in Dagami is Patoc Senior High School, having a separate campus with Patoc National High School but within the jurisdiction of Barangay Patoc. Patoc National High School used to be integrated with Patoc Elementary School until it established its own campus beginning in 1986. Barangay Patoc is now distinguished as the only barangay government unit within the municipality of Dagami having three separate campuses for basic education. The two integrated public high schools are Guinarona National High School in the west, Santa Mesa National High School located in the town proper, and the newly-opened Cansamada National High School in Barangay Cansamada East which is the southernmost village of the town. The lone private, Catholic-run high school is Saint Joseph High School located in the town center. It is one of the oldest schools in the Philippines established by the Jesuits in the 1600 when they first established their rectory in the town upon landing in Philippine islands during the early century of Spain's conquest of the Philippines. Huron Institute which opened as a vocational training center assisted by the Technical Education and Skills Development Authority or TESDA at Barangay Patoc closed down due to lack of funding. Leyte: Towns' Historical Legends By Francisco Tantuico, Jr.
^ "Province: Leyte". PSGC Interactive. Quezon City, Philippines: Philippine Statistics Authority. Retrieved 12 November 2016. ^ The Colonial Odyssey of Leyte by Rolando Borrinaga and Father Cantius J. Kobak OFM, an English translation of Reseña de la Provincia de Leyte por Manuel Artigas y Cuerva. ^ "An Act Transferring the Barrios of Capahu-an and Guingawan, Municipality of Dagami, Province of Leyte, to the Municipality of Tabontabon". LawPH.com. Retrieved 2011-04-12. Wikimedia Commons has media related to Dagami. This page was last edited on 16 March 2019, at 08:03 (UTC).